FalconStor Virtual Tape Library (VTL) is the market-leading virtual tape solution, superior in scalability and performance. Backups complete much faster and with higher reliability, little or no change is needed to the backup environment. Operations have no change. Backups simply get better. Highly sophisticated physical tape integration and security of the data complete the solution. Seamless data deduplication greatly reduces storage needs, reducing the storage needs by 95% or more. Customers are able to keep weeks or even months worth of data on disk, allowing for fast restores, eliminating concerns of tape-based restoration. A FalconStor VTL appliance can achieve backup speeds of 1.6 GB per second, or over 5.8 TB per hour, allowing users to solve the single biggest issue in backup: meeting the backup window. Up to eight appliances can combine into a single logical unit, scaling performance to a remarkable 12.8 GB per second, or 46 TB per hour. Combined with the latest high-speed protocols, including 8Gb Fibre Channel (FC) and 10Gb Ethernet, FalconStor VTL can sustain deduplication rates of over 800 MB per second, linearly scaling in performance to a sustained deduplication rate of 9.7 TB per hour. Typical deduplication ratios of 20:1 reduce storage footprints by 95% or more. FalconStor VTL with Deduplication scales to meet the data growth needs of today’s largest enterprises with global deduplication that scales to over 1PB of physical usable storage. Deduplicated virtual tapes in remote locations can be globally replicated via the WAN to the data center, where the VTL solution aggregates the data into a clustered repository of globally unique data. Designed as an enterprise-class application, FalconStor VTL can support small and ROBO environments through storage appliances and small-footprint virtual appliances, and is also available as a high-availability (HA) clustered solution for the enterprise. 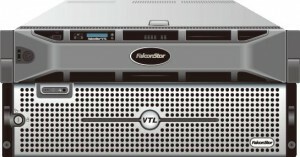 FalconStor VTL Virtual Appliance: for ROBO environments leveraging VMware technology. FalconStor VTL 100 Series Appliances: all-in-one appliances SMB and ROBO environments. FalconStor VTL/SIR Cluster Deduplication Gateway Appliances: for large enterprises, offering high-availability clustered deduplication.